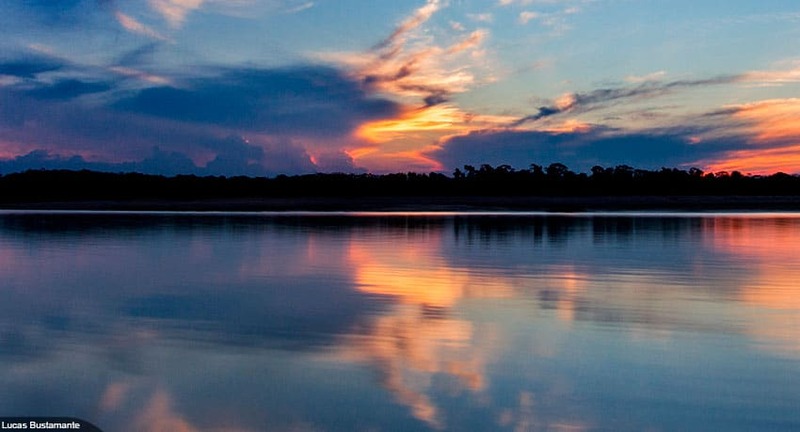 Posted by: Ash on June 4th, 2018, in Guides. .
Peru’s Amazon Rainforest offers one of the best areas of Amazon to visit. Peru has the second highest amount of rainforest after Brazil. Peru offers one of the most thought out tourism industries in Amazonia. There are more claylicks in the Peruvian Amazon than anywhere else in South America. Along with Ecuador, Peru’s rainforest is located in western Amazonia, which offers the most wildlife (linked to the nearby Andes Mountains). 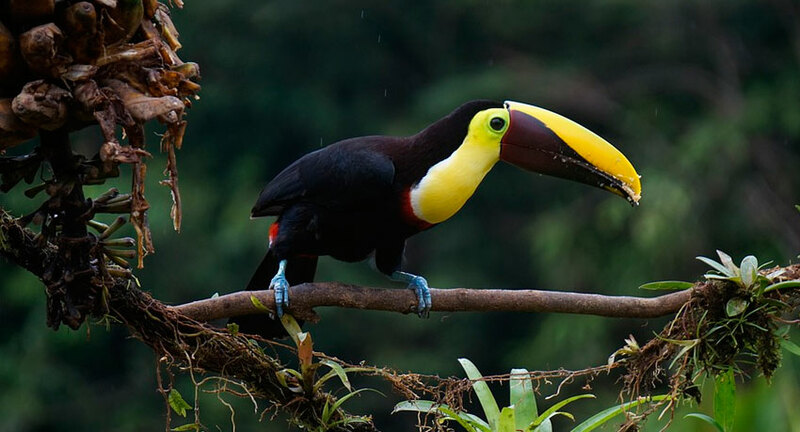 With these things in mind, the Peruvian rainforest is an incredible place to visit for beautiful scenery, fantastic wildlife opportunities, relaxing cruises, and adventure tours. But where in the vast Peruvian jungle do you visit? First, let’s first have an introduction to this vast tropical forest. Home to more life than anywhere else on Earth, the Amazon Rainforest, the largest rainforest on Earth, crosses nine nations and covers 40% of the South American continent. The next largest forests of the Congo in Africa and the tropical wilderness of New Guinea can fit comfortably inside the Amazon. The vast tropical forest is fed by the Amazon River, which itself ranks as one of the world’s largest rivers. Fed by over 1,000 tributaries and crossing the continent, the Amazon is the second largest river after the Nile. Beginning as a trickle in the Ecuadorian and Peruvian Andes, the giant river travels the continent to its mouth in Brazil. Here, the Amazon expels a vast quantity of water into the Atlantic Ocean. The majority of the Amazon Rainforest is contained within Brazil, Peru, Colombia, Bolivia and Venezuela. Within these areas, you can enjoy some incredible wildlife sightings. Wildlife to see includes the iconic Amazon Rainforest animals, such as macaw parrots, tapir, monkeys, and even jaguar. The Amazon contains several different types of vegetation and isn’t limited to rainforest. Dispersed within the Amazon, you can find seasonal forests, flooded forests, and even grasslands. These areas contain their own wildlife communities and add to the diversity of Amazonian life. Containing the second highest amount of Amazon Rainforest after Brazil, the Peruvian rainforest is one of the best regions of Amazonia to visit. There are two main gateways for the Peruvian Amazon, which are Iquitos as a port of the Amazon River in Peru’s north and Puerto Maldonado in the south. Puerto Maldonado provides access to the incredible Tambopata National Reserve and Manu lowlands. The southern Peruvian Amazon from Puerto Maldonado offers more claylicks than anywhere in South America. Enjoy visiting the licks to see hundreds of colorful birds. The parrots visit the areas to eat clay, which is thought to provide essential salts and help neutralize toxins found in the birds’ diet of unripe fruits and seeds. There are fantastic lodges to enjoy guided tours to Tambopata’s claylicks, such as the Tambopata Research Center and Refugio Amazonas Lodge. In addition to the claylicks, within the Peruvian Amazon you can find beautiful lakes home to lake-living wildlife. Some of these are even home to endangered giant river otters. There are also fantastic cruises to enjoy on the Amazon River from Iquitos and jungle lodges for guided expeditions of the Iquitos rainforest. We will mention our rainforest tour recommendations further down the page. Peru has protected around 15% of its land area placing different areas under various categories of protection. Among these parks and reserves are some fantastic protected areas of Amazon Rainforest, including the Tambopata National Reserve, Manu National Park, Pacaya Samiria National Reserve and Tamshiyacu Tahuayo Reserve. Found in southern Peru near the gateway jungle town of Puerto Maldonado, the Tambopata National Reserve offers a fantastic area of Amazonia to visit. Protecting 274,690 hectares, the reserve includes for the forest fed by the Tambopata and Heath River. Because Tambopata is so close to the gateway jungle town of Puerto Maldonado, this is often the best choice for a short 2 or 3-day rainforest tour. This is because you can be in areas of high diversity after only 30 minutes or travel time. The reserve offers continual forest with other protected areas, including the Madidi National Park and Bahuaja Sonene National Park. This allows wildlife to move freely in a vast area of protected tropical forest. On guided tours, enjoy an abundance of tropical birds, several different monkeys, tall emergent trees and many different flowers. There are also many claylicks where you can watch colorful parrots. There are some fantastic lodges within and nearby the Tambopata Reserve for some fantastic guided rainforest tours. Our recommendations are the Tambopata Research Center for deep jungle adventures for the best wildlife watching opportunities, the Posada Amazonas for giant river otters, and the Refugio Amazonas in the Tambopata buffer zone. Let’s have a look at the wildlife you can see from these three lodges. The percentages represent your chance to see each animal. The Manu National Park is one of the more famous areas of Peruvian Amazon. This vast expanse of forest covers 1.7 million hectares of lowland rainforest and Andean forest. An incredible diversity of species are found in Manu National Park and the park has won world records for diversity. Although visitors are not permitted inside the national park itself, you can tour the reserved zone and connected Amarakaeri Communal Reserve. Lake Salvador in the Manu Reserved Zone is one of the main attractions of the area. In and around the lake, enjoy spotting giant river otters, many different birds, and different monkeys in surrounding rainforest. Like Tambopata, the Manu region is also famous for claylicks and you can see many colorful macaws gathered at the clay. From the Manu Wildlife Center, enjoy a large macaw claylick and have a high chance of spotting tapir at the tapir lick. Located around 150 km from Iquitos, a port city of the Amazon River in northern Peru, you can find the Tamshiyacu Tahuayo Reserve. The reserve was founded for local initiatives and also to protect the range of the rare red uakari monkeys. These monkeys have red fur and a bald head and live in the middle of the Tamshiyacu Tahuayo area. The Tamshiyacu Tahuayo Reserve contains both flooded and non-flooded forest with many different emergent trees, bromeliads and orchids. There are many other monkeys that live in the reserve. On tours from the Tahuayo Lodge, you can spot howler monkeys, capuchins, tamarins, pygmy marmosets, titis, and saki monkeys. The reserve is also home to an impressive diversity of birds, including hoatzins, oropendolas, macaws, toucans, and colorful cotingas and tanagers. Although rarely seen, camera traps from the Tahuayo Lodge and Amazon Research Center, located deeper in the reserve, have revealed a population of jaguar living in the area. The camera have also revealed images of black jaguar visiting the reserve. Accessed from Iquitos in Peru’s northern Amazon, the Pacaya Samiria National Reserve is one of the largest of Peru’s protected areas. This is a mostly flooded area of Amazon Rainforest best experienced on a rainforest cruise. Protecting just over 2 million hectares of tropical forest, within the Pacaya Samiria Reserve you can find an incredible diversity of animals and plants. In addition to spectacular scenery, enjoy watching pink river dolphins, colorful birds, several different monkeys, and tall trees with orchids and bromeliads perched on the branches. There are some fantastic cruises to explore the Pacaya Samiria flooded forest, including the adventure category cruise of La Perla and the entry level luxury cruise of the Delfin III. You can also choose the luxury-class vessels of the Aria Amazon Cruise, Delfin II and the exclusive Delfin I. Each of these offers high levels of comfort, delicious cuisine, and excellent guided tours into Amazonia to enjoy fantastic wildlife opportunities. The Amazon Rainforest is a fantastic places to visit. Within this vast forest, lodges have often been built near the best areas for wildlife viewing. Because of this, lodges are often placed near oxbow lakes or claylicks. Claylicks are areas of exposed ground, usually on the riverbank, where different animals come to feed from salt-rich and medicinal clay. In the Amazon Rainforest, the most famous animals that visit the licks are the large and colorful macaws. However, many other animals including parrots, monkeys, peccary, capybara, and tapir also visit different licks. Because of the draw to parrots and herbivores, predators such as margays, ocelots and even jaguar patrol the claylicks looking for an easy meal. It’s not unusual to watch these animals catch their prey when watching the birds. The claylicks offer guests almost guaranteed wildlife spectacles with hundreds of colorful parrots seen at one time. Enjoy seeing the many different species of Peruvian macaws. These include blue-and-yellow macaws, scarlet macaws, red-and-green macaws, chestnut-fronted macaws, red-bellied macaws, blue-headed macaws, and red-shouldered macaws. 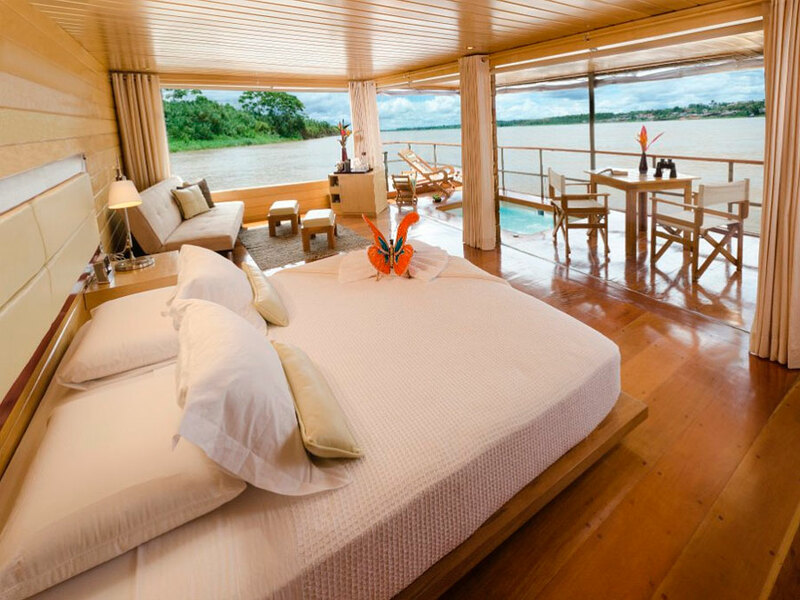 Some favorite lodges to enjoy the claylicks are the Tambopata Research Center, Refugio Amazonas Lodge, and the exclusive Amazon Villa from Puerto Maldonado in Peru’s south. Lakes in the Amazon Rainforest are often oxbow lakes, which are areas where tributaries of the Amazon River once flowed but the river has since changed direction. This has left behind bodies of water cut off from the rest of the tributary, which often have an oxbow shape due to the river once curving its way through the forest. These lakes attract a wide variety of Amazon Rainforest animals. Different trees and plants start to grow, which attract a variety of monkeys as they fruit and flower. The lake itself provides home to caiman crocodilians and many different fish, including the giant arapaima. Cormorants, herons, and hoatzins then patrol the lake edges. Sometimes, the lakes also provide home to endangered giant river otters, which can often be seen at the fantastic community-owned Posada Amazonas Lodge. There are some fantastic areas in Peru to experience the tropical forest and to find fascinating animals and plants. The two best regions to experience the Peruvian Amazon Rainforest are around the rainforest gateways of Iquitos in the north and Puerto Maldonado in Peru’s south. Puerto Maldonado is a fantastic gateway to Peru’s Amazon Rainforest. This is the best choice if you’re interested in a short rainforest experience of 2 or 3 days as incredible diversity of animals and plants are found in the nearby Tambopata National Reserve. The protected areas from Puerto Maldonado to visit are the Manu National Park region and Tambopata National Reserve. Both of these areas offer outstanding levels of wildlife. Puerto Maldonado offers a consistent temperature with a tropical climate. The year is mainly separated into a wet season and dry season. Although rain can fall at all times of year, which nourishes the trees and plants, the rain is more intense over the wet weather months. Puerto Maldonado also experiences cold fronts blown up from Argentina over the months of May through September when temperature can get down to 43° F (5° C) for a few days at a time. As with other tropical environments, the main temperature difference is between day and night instead of between months. For more information on Puerto Maldonado, you can see the Puerto Maldonado travel guide. 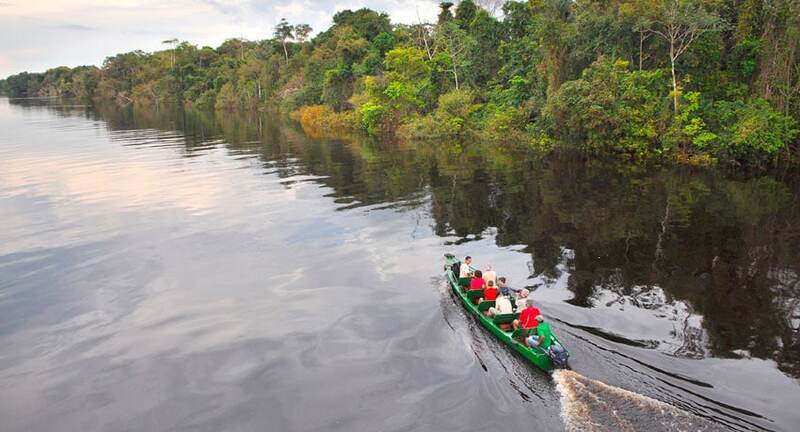 The Refugio Amazonas Lodge offers a fantastic experience for a 3 or 4-day tour of the Amazon Rainforest. A comfortable lodge in the buffer zone of the wildlife-rich Tambopata National Reserve, enjoy guided small-group expeditions in the Peruvian Amazon. The lodge offers one of the only children’s trails in the Amazon, which makes it a great place for families with small children. Enjoy a canopy tower to spot toucans, parrots and other birds flying over the rainforest canopy. You will also visit small claylicks and have a chance to visit a large macaw claylick. Pick from a range of activity options offered from the Refugio Amazonas, including the canopy tower, ethnobotanical trail, jungle mountain biking, lake visits and kayaking. A community-owned lodge near a fantastic lake for spotting endangered giant river otters, the Posada Amazonas is a great rainforest lodge for a 3 or 4-day experience of the Amazon Rainforest. Enjoy guided tours led by members of the Ese-Eja community to explore the surrounding rainforest. See several different monkeys, colorful birds, different reptiles, amphibians, tall rainforest trees and delicate flowers. In addition to the resident giant river otters, the nearby lake is home to hoatzin birds, caiman crocodiles and horned screamers. From Posada Amazonas Lodge, you will also visit a working community farm and enjoy the ethnobotanical trail. You can also visit a small claylick to watch colorful parrots. On tour from Posada Amazonas Lodge, enjoy the tall canopy tower for watching birds over the rainforest canopy, rainforest walks and night hikes. You can also enjoy a selection of add-on activities, including kayaking, mountain biking and canopy climbing. Offering a private experience of the Peruvian Amazon, the Amazon Villa offers your own private lodge in the buffer zone of Tambopata National Reserve. Enjoy your own private rainforest lodge with a private guide, WiFi, a bath, and a range of different activities. Head out into the rainforest on guided trail walks to find several different monkeys, colorful birds, beautiful butterflies and tall emergent trees. 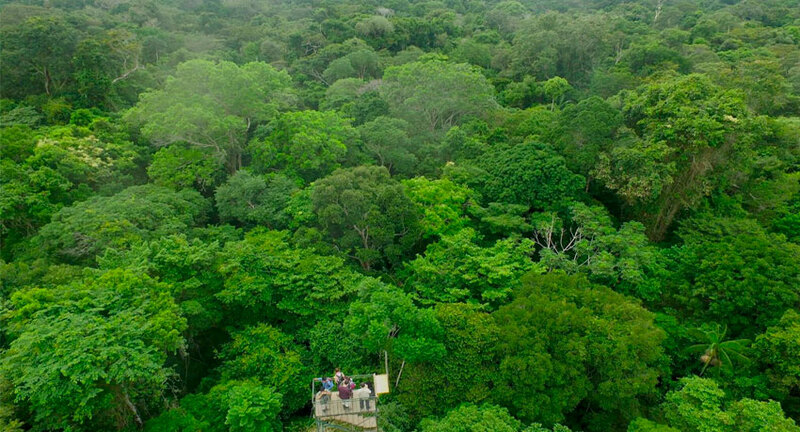 There is also a canopy tower to enjoy gazing over the rainforest canopy and watching birds fly high above the forest. There are also different activities to choose from, such as jungle mountain biking, canopy climbing, paddle boarding, and kayaking. Enjoy very comfortable accommodation and delicious meals. You have a choice of enjoying meals in private at the villa or visiting the nearby Refugio Amazonas Lodge to enjoy talks and meals with other guests. 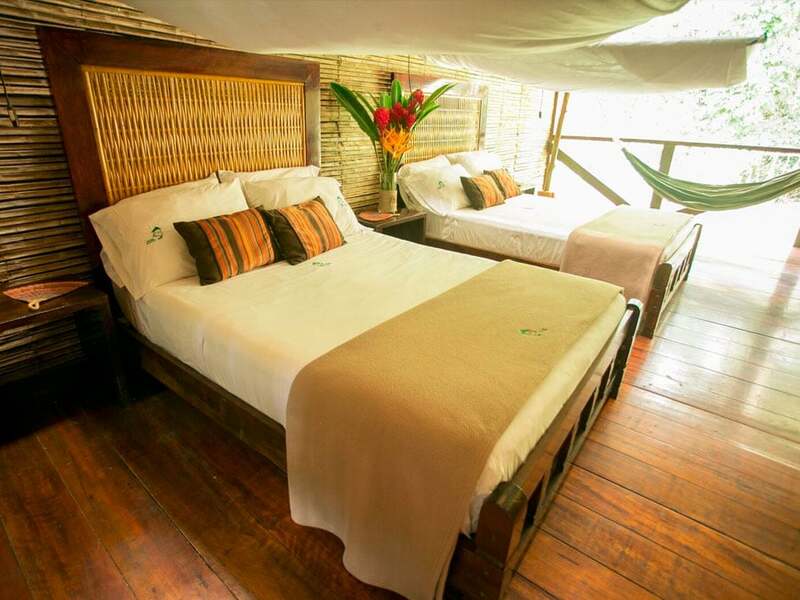 The Tambopata Research Center is one of the deepest lodges in the Amazon Rainforest. Enjoy comfortable accommodation with different suite types, including luxurious deluxe suites. 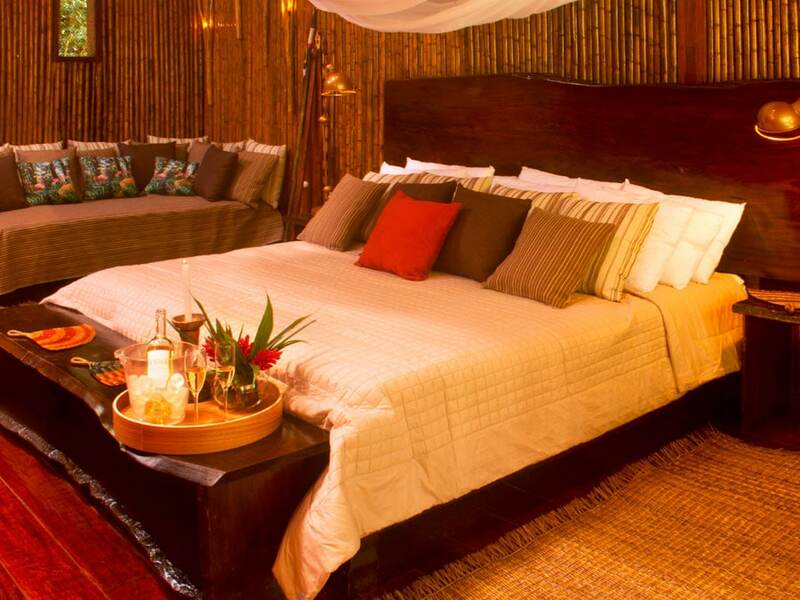 From this comfortable lodge, enjoy expertly guided tours deep in Tambopata National Reserve. Due to the lodge’s position, the surrounding rainforest is at carrying capacity for wildlife. Visitors even enjoy a 20% chance of seeing jaguar by the river. The lodge is also located near one of the largest macaw claylicks in the Amazon Rainforest where you can see hundreds of parrots gathered at the clay. Guests at the Tambopata Research Center will also visit the Refugio Amazonas Lodge mentioned above enroute to the Tambopata Research Center. While at the Refugio Amazonas Lodge, enjoy the canopy tower to spot toucans and different parrots flying over the rainforest. Led by skilled guides, explore the rainforest to find many different animals and plants. You’re likely to see spider monkeys, howler monkeys, tamarins, peccary, and a diversity of different birds. You will also enjoy stunning scenery of the Tambopata region. Iquitos is a port city of the Amazon River to enjoy guided tours of the Peruvian Amazon. Choose from different lodges for the rainforest and multi-day cruises of Pacaya Samiria National Reserve. Famous as the largest city on Earth unconnected to any other by road, you can visit the city aboard a direct flight from either Lima or Cusco. The main attraction here is enjoy a tour from an Amazon Rainforest lodge or cruise. However, there are also some different things to do in Iquitos itself. A favorite thing to do in Iquitos city is to enjoy visiting the Manatee Rescue Center. Here, you can see manatees and turtles being cared for before their release into nearby protected areas. This option is included on many cruises and different rainforest lodges can add this to your itinerary. Like many other tropical areas, Iquitos is a fantastic place to visit no matter when you wish to travel. However, there is a wetter season from October to June. Note that wet weather can be expected at all times of year. The rain often falls towards late afternoon and evening then clears by the next morning. This means it doesn’t usually affect your experience. But sometimes the rain can last for a few days at a time. For more information, you can see the Iquitos Travel Guide. There are some fantastic tours from Iquitos, including deep jungle lodges and Amazon RIver cruises. A Rainforest Alliance certified lodge and one of the favorite lodges in Amazonia for wildlife lovers, the Tahuayo Lodge offers both the main Tahuayo Lodge and Tahuayo River Amazon Research Center. Enjoy a deep rainforest experience to see fantastic wildlife on guided walks. Spot pink river dolphins in the Amazon’s tributaries, many different monkeys, toucans, macaws, anaconda, blue morpho butterflies, poison dart frogs, and caiman crocodilians. The monkeys you can find are particular diverse. Your guide will guide you along trail walks in the rainforest to find capuchins, squirrel monkeys, titi monkeys, sakis, howler monkeys, pygmy marmosets and tamarins. A few lucky visitors are even fortunate to see the rare red uakari monkeys deep in the reserve. The Tahuayo Lodge offers itineraries from 4-days and over. However, 6 days are required to visit both the Tahuayo Lodge and Tahuayo River Amazon Research Center. Tours of 4 and 5 days will be restricted to the main lodge, which still offers abundant wildlife and a range of activities. Enjoy a private and custom tour as standard to explore the Tamshiyacu Tahuayo Reserve on walking trails, traditional canoes, boat trips and night spotting excursions. 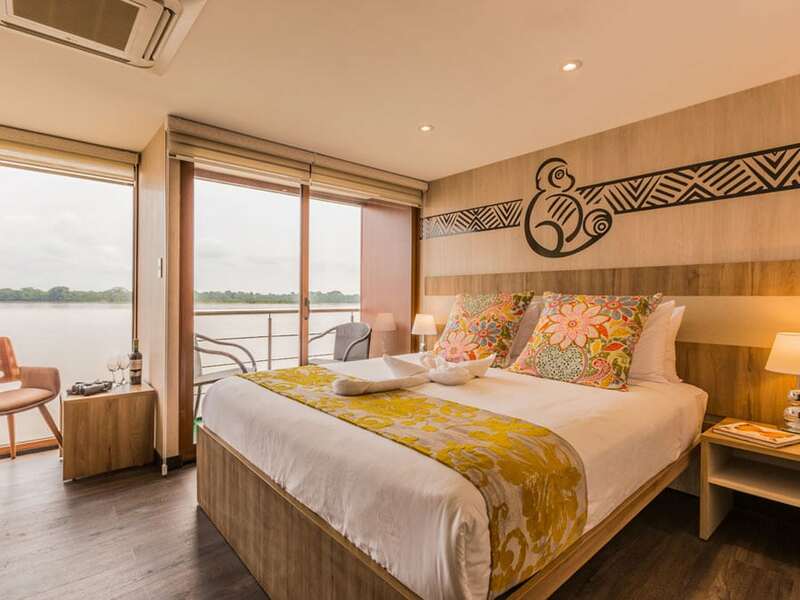 Providing a luxury cruise into the Pacaya Samiria National Reserve from Iquitos, the Delfin II offers a fantastic experience of the Amazon Rainforest. There are 14 guest rooms in total aboard the Delfin II. Enjoy luxurious suites, including Master Suites at the front of the vessel and spacious suites throughout. Each has a large picture window for fantastic views of the reserve as you travel deep into Amazonia. In addition to very comfortable suites, enjoy the window-wrapped dining room for delicious meals, the observation deck with small library, lecture room and lounge, and fantastic excursions into the rainforest. With highly trained naturalist guide, explore the Amazon Rainforest’s Pacaya Samiria Reserve to find colorful birds, different monkeys, pink river dolphins and much more. See bromeliads and orchids resting on giant trees as you visit different areas of the very scenic reserve. The Aria Amazon Cruise is a luxury cruise that provides longer itineraries into the Pacaya Samiria National Reserve. Enjoy elegantly styled interiors, floor-to-ceiling windows throughout the vessel, delicious cuisine and spacious accommodation and relaxation areas. The Aria offers just 16 comfortable cabins and keep groups-sizes small for excursions. Enjoy your spacious suite and large bed with the finest Peruvian linen. This is often a favorite place to relax as you observe the Amazon through your suite’s floor-to-ceiling window. The vessel then offers an indoor and outdoor lounge, observation deck, exercise facilities and dining room. The dining room is where you will enjoy delicious 5-star meals created by Chef Pedro Miguel Schiaffino. 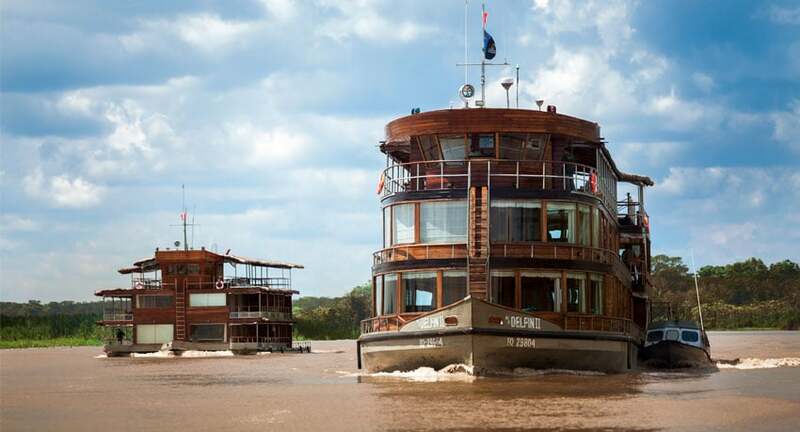 In addition to enjoying the vessel itself, you will also head out with expert guides to explore Amazonia. On skiff expeditions with a maximum of 8 guests, explore the waterways of Pacaya Samiria National Reserve to find some incredible Amazon Rainforest animals and plants. See monkeys move through the trees, parrots and toucans flying overhead, caiman crocodiles at night, and spectacular scenery. La Perla Amazon Cruise offers an adventure-category cruise of the Pacaya Samiria National Reserve from Iquitos. Although not a luxury vessel, enjoy comfortable accommodation, relaxation areas, and delicious meals served in the window-wrapped dining room. There is also an outdoor hammock area to relax watching the rainforest pass by. You will then leave the main vessel to enjoy small-group excursions along the Pacaya Samiria’s waterways scouting for a diversity of Amazonian animals and plants. Spot several different monkeys, toucans, macaw parrots, caiman crocodilians, orchids and bromeliads clinging to the trees, and a variety of amphibians. Hopefully, you will also enjoy seeing the pink river dolphins and other Amazon icons.